BOLDLY INCLUSIVE. INTENTIONALLY CHALLENGING. ​JOYFULLY CHRISTIAN. ﻿​Worship with us on our live stream! Every Sunday at 10:00 am! Our school integrates Christian beliefs and values into a developmentally appropriate curriculum. 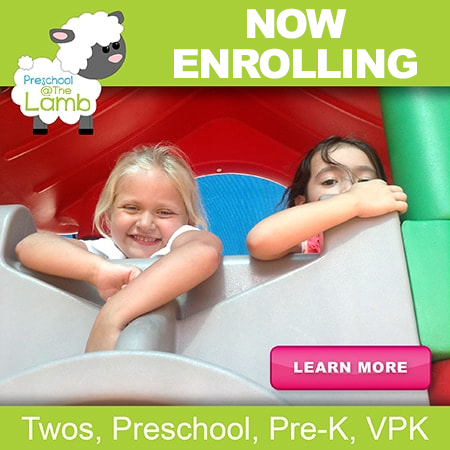 We offer Christian daycare programs for Twos, Pre-K, and VPK classes. ​Monthly themes provide a broad focus for the children’s activities and explorations. Children are introduced to bible stories and have weekly chapel time. Subscribe to our Newsletter and stay up to date with News, Events, and much more! ​Here at Lamb of God, we offer several different opportunities for contributions. Whether you prefer writing a check or having a monthly tithe automatically drawn from your checking account, we can get you started. Click below to learn about all the opportunities and decide which one is best for you! Check out the latest events on the church calendar at Lamb of God! ​There is always something going on, so come join us! We’d love to see you!